Both non-ionizing and ionizing radiation methods are applied for sterilization. Ultraviolet light irradiation (UV, from a germicidal lamp) is useful only for sterilization of surfaces and some transparent objects. Many objects that are transparent to visible light such as glass, absorb UV. UV irradiation is routinely used to sterilize the interiors of biological safety cabinets between uses, but is ineffective in shaded areas. The drawback of UV radiation is that it damages some plastics, such as polystyrene foam, if they are exposed for prolonged periods of time. 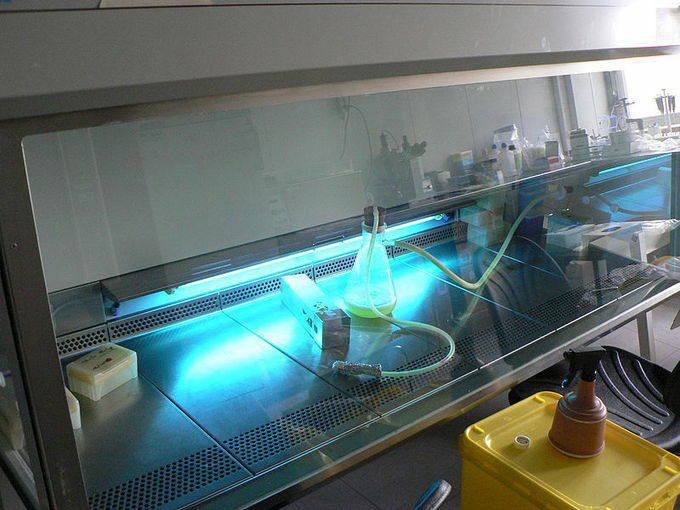 UV light used in the laboratory: UV light is commonly used to irradiate and sterilize laminar flow cabinets between uses. Ionizing radiation could be a lethal health hazard if used inappropriately. The proper use of these methods is regulated and monitored by world and national safety organizations. Any incidents that have occurred in the past are documented and thoroughly analyzed to determine root cause and improvement potential. Gamma rays: Gamma rays are very penetrating and are commonly used for sterilization of disposable medical equipment, such as syringes, needles, cannulas and IV sets, and food. The gamma radiation is emitted from a radioisotope (usually cobalt-60 or cesium-137). Cesium-137 is used in small hospital units to treat blood before transfusion to prevent Graft-versus-host disease. Use of a radioisotope requires shielding to ensure the safety of the operators while in use and in storage as these radioisotopes continuously emits gamma rays (cannot be turned off). An incident in Decatur, Georgia where water soluble cesium-137 leaked into the source storage pool requiring NRC intervention has led to near elimination of this radioisotope; it has been replaced by the more costly, non-water soluble cobalt-60. Sterilization by irradiation with gamma rays may, in some cases affect material properties. Electron beams: Electron beam processing is also commonly used for sterilization. Electron beams use an on-off technology and provide a much higher dosing rate than gamma or x-rays. Due to the higher dose rate, less exposure time is needed and thereby any potential degradation to polymers is reduced. A limitation is that electron beams are less penetrating than either gamma or x-rays. Facilities rely on substantial concrete shields to protect workers and the environment from radiation exposure. X-rays: High-energy X-rays are a form of ionizing energy allowing to irradiate large packages and pallet loads of medical devices. X-ray sterilization is an electricity based process that does not require chemical or radioactive material. High energy and high power X-rays are generated by an X-ray machine that can be turned off when not in use, and therefore does not require any shielding when in storage. Irradiation with X-rays or gamma rays does not make materials radioactive. Subatomic particles: Subatomic particles may be more or less penetrating, and may be generated by a radioisotope or a device, depending on the type of particle. Irradiation with particles may make materials radioactive, depending on the type of particles, their energy, and the type of target material: neutrons and very high-energy particles can make materials radioactive but have good penetration, whereas lower energy particles (other than neutrons) cannot make materials radioactive, but have poorer penetration. Irradiation is used by the United States Postal Service to sterilize mail in the Washington, DC area. Some foods (e.g. spices, ground meats) are irradiated for sterilization. Ultraviolet light irradiation is a non-ionizing method useful only for sterilization of surfaces and some transparent objects. Common methods of ionizing radiation are gamma rays, electron beams, X-rays, and subatomic particles. However, ionizing radiation could be a lethal health hazard if used inappropriately. The proper use of these methods is regulated and monitored by world and national safety organizations. Graft-versus-host disease: A complication after tissue or organ transplant or blood transfusion if the blood was not irradiated. White blood cells of the transplanted tissue or organ (the graft) attack cells in the recipients body (the host).